San Francisco International Airport (SFO) has opened a yoga room, which it claims is the first in the world*. This is a brilliant idea, as anyone who has flown coach-class will tell you. Personally, I always get funny looks when I use the departure-lounge floor as a carpeted stretching mat, so the idea of a dedicated yoga room makes me smile. Hopefully they have a strict regimen for cleaning the free mats. The best part: the infographic for “Yoga Room”, depicting a serene figure (dare I say Buddha-like?) in the lotus position. John Mola’s culinary-heavy short film chronicles the ever-changing face of San Francisco’s North Beach. Similar to NYC’s Little Italy, North Beach is an Italian neighborhood bordering a growing Chinatown. These days, though, Italian-owned businesses are beginning to move back in. 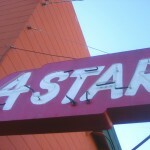 North Beach and Chinatown are fantastic, and I love seeing them on film. San Francisco’s North Beach Old and New from Spots Unknown on Vimeo. 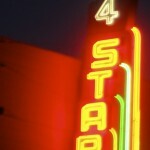 The 4 Star Cinema is another casual San Francisco landmark: a building that persists through time. Unlike most of America, San Francisco seems to cling to its architectural history on a local level: walking down Clement street, you could be in 1952 or 1975 or, in this case, 2010. Some guy decided to run the San Francisco Half Marathon while drinking beer. Not just drinking beer, but seriously drinking beer. One beer per mile. That’s thirteen beers. While running a half marathon. Amazingly, he actually finished the run. He mapped out the liquor stores along the route, accomodating for the fact that no bottle shops appear on the Golden Gate Bridge or its approaches. This guy, who posts as djtennessee has a blog dedicated to working out while smoking and drinking. Personally, I have to get my exercise done before the first beer of the evening.